LOCKLINEEverywhere in the country local pubs are forced to close their doors, but de Kerckhaen survives. A film on the most important spot in Westbeemster. A selection of local and regional news shows us that the local pub is having a hard time in the Netherlands. In the past five years the amount of pubs has decreased by 4%, while the rest of the industry has only grown. How can this happen when the local pub is of such importance to a small community? Also in Westbeemster local pub the Kerckhaen had been empty for a couple of years. The previous owners couldn't find a successor and the village lost their most important gathering place. In 2005 a group of villagers got together to save the building for the community; and they succeeded. In merely half a year they raised €700.000, half of which was donated by the villagers themselves, and so they could pay for the pub. For the documentary Our Pub, filmmakers Hannah Grout and Dennis Jongeling follow manager Bart Bakker and the visitors through everything that takes place in de Kerckhaen; from the card association every thursday afternoon to a concert of a well know rock band. Bart serves his guests with love, but he also has doubts: not eveything he organises is very well attended and the older generation who forms the core of the village is slowly getting smaller. In the film Bart battles between his love for Westbeemster and his doubts about the pub. Almost everything has been shot and we are getting started with the editing. But to comletely finalize this film and to be able to distribute it, we need money. A composer and color corrector need to be financed, the gasoline bill that the little red car that we have been using for the last couple of months has created needs to be paid, the DVD's have to be developed and we want to subscribe to national and international filmfestivals. Through this documentary we want to show you how this village protects its pub and why it is so important for a small community like Westbeemster to have a place like de Kerckhaen in its midst. "You can really do anything here, it's a lifecycle building." 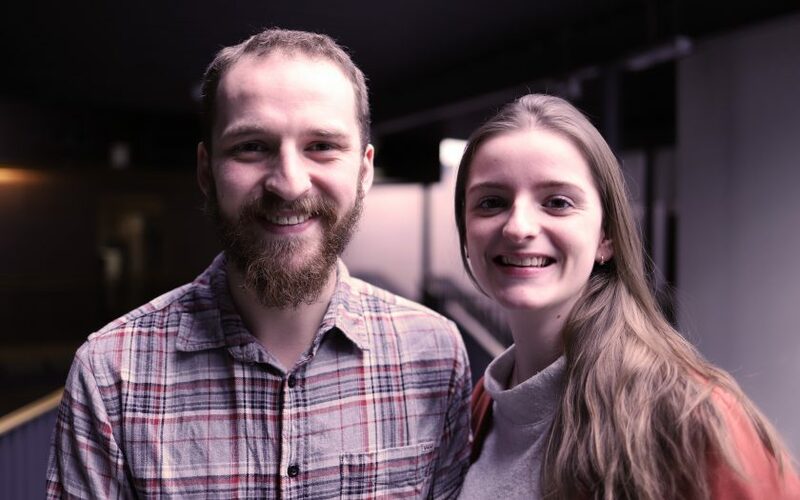 Dennis Jongeling and Hannah Grout did their first project together during their first year of the School for Journalism. Now that they're in the final phase, it is time for a bigger project: a first documentary. 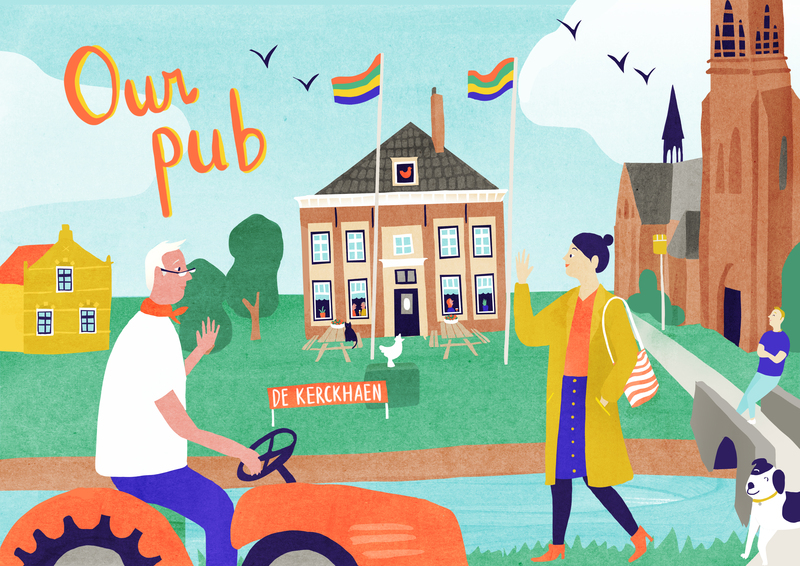 In their own favorite pub in Utrecht, the idea was born to make a film about a local pub in a small village. Our Pub will be premiering at the CampusDoc International Filmfestival on June 16 & 17 2018 in the Louis Hartlooper Complex in Utrecht. Wordt een prachtige film, heel veel succes!! Met nog 5 dagen tot het einde van onze crowdfunding, hebben wij het streefbedrag van €3000 behaald. Door de hulp van jullie, onze 77(!) supporters, kunnen wij Ons Café nu afmaken en hem zo snel mogelijk aan de wereld gaan laten zien. Wil je jezelf nog verzekeren van een DVD van Ons Café? Je hebt nog tot vrijdagmiddag 25 mei om een extra donatie te storten, voor €25 komt de DVD jouw kant op! Met nog meer dan 3 weken te gaan hebben we al meer dan 40% van ons streefbedrag binnengehaald. Alle donateurs: ontzettend bedankt! Ondertussen hebben wij ook niet stilgezeten. We schieten heel erg op met de montage en de film begint langzaam steeds meer vorm te krijgen. Ook zijn de Ons Café-bierviltjes besteld, houd onze Facebook-pagina in de gaten voor de eerste foto's! Met de 41% zijn we er natuurlijk nog lang niet! Dus heb jij die ene neef met een eigen bedrijf die wel toe is aan een nieuw bedrijfsfilmpje? Of een oom die alle café's wel een warm hart toedraagt? Of ben je Beemsterling en weet je zeker dat je buren ons nog niet gesteund hebben? Trek iedereen aan de mouw! Alle kleine en grote beetjes helpen en zorgen ervoor dat Ons Café er straks prachtig uitziet en perfect klinkt. Thanks a lot! You have helped us to make Our Pub slightly better than €10,- ago. A set of exclusive Our Pub-beermats is coming your way. No more stains on the table! Hooray! Oh yes! You have just insured yourself of an online link to the film, a DVD and an exclusive set of Our Pub-beermats. Apart from all the goodies mentioned above you are in the race of winning one of the six Our Pub-IPA sixpacks. They go well with the extra beermats that we will send along. Wow, thank you! Of course you will receive a DVD, an online link to the film and a set of exclusive beermats. Apart from that you have a chance of winning two of the four tickets to the premiere on the 16th and 17th of June, exciting! Everybody should know that you helped us out with making this film. Your (company)name will adorn the credits. Of course a DVD and an online link will come your way, so everybody can check out these credits with your name in them. Lets not forget the exclusive Our Pub-beermats we will send along with all these other goodies. Thanks times 250! You, along with a +1, will definitely be attending the CampusDoc-filmfestival on the 16th and 17th of June where Our Pub will be revealed for the first time. And be sure to pay attention during the credits, because you will be able to see your (company)name shine on the big screen. A DVD and a set of exclusive Our Pub-beermats will come home with you as souvenirs. We are so incredibly happy with you! For that reason we give you the choice between two rewards: the filmmakers will make a short video for your company, or you and your friends/family/colleagues will be provided with a set of professional profile pictures. Of course the DVD, link to the online film and the exclusive beermats will also come your way. Well, hello! How can we possibly thank you? No, but really, tell us. You get to choose from any of the rewards mentioned above. If that doesn't please you enough, we would love to come to your home or your local pub to screen the film along with a Q&A afterwards. 79 supporters have contributed to this project!